The need for an effective and low cost forest and biodiversity restoration and rehabilitation methods is now highlighted in the face of climate change and the global phenomenon of rapid loss of forests and biodiversity. An estimated 850 million hectares of degraded forests exist globally. This need to rehabilitate these degraded forests is prominently enshrined in several global agreements such as the Convention on Biological Diversity and the Kyoto Protocol among others. The task of forest restoration and rehabilitation is especially daunting for developing countries with inadequate financial resources required for the rehabilitation of critical areas to bring back lost biodiversity and ecosystem services. ANR is a method for enhancing the establishment of secondary forest from degraded grassland and shrub vegetation by protecting and nurturing the mother trees and their wildlings inherently present in the area. ANR aims to accelerate, rather than replace, natural successional processes by removing or reducing barriers to natural forest regeneration such as soil degradation, competition with weedy species, and recurring disturbances (e.g., fire, grazing, and wood harvesting). Seedlings are, in particular, protected from undergrowth and extremely flammable plants such as Imperata grass. In addition to protection efforts, new trees are planted when needed or wanted (enrichment planting). 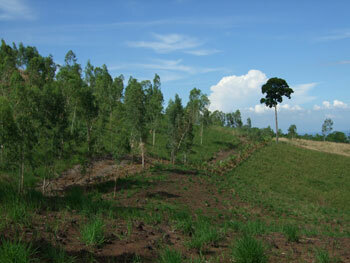 With ANR, forests grow faster than they would naturally. increase carbon sequestration and carbon sinks which contribute to climate change mitigation.